This Northampton course is open to the public - with a 18 hole course which aims to offer good value golf. Sample one of this country's finest golf courses, part of the historic Woburn Estate in Bedfordshire. The club has a range of day packages for visitors. A famous course, with 18 challenging holes. This was the UK's first Johnny Miller designed course. It is situated just 2 minutes off Junction 15 of the M1 motorway in Northampton. 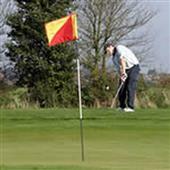 Brampton Heath Golf Club is an undulating course with enjoyable views. There's an 18-hole and 9 hole course. Day visitors are welcome. Offers courses that are "Pay and Play", with either 9 or 18 holes that can be played free of membership fees.